As with any red carpet premier the list of people expected to attend can change, but early word is that Gus Van Sant, Sean Penn and James Franco are all expected to be there. PDXPipeline is reporting that Mayor-elect Sam Adams and The March Forth Marching Band are also expected to be in attendance. 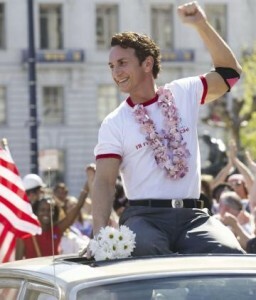 Milk is one of Gus Van Sant’s highest profile films in years and it tells the story of prominent gay activist and San Francisco city politician Harvey Milk during the years leading up to his assassination in 1978. Early buzz from some select critics who have seen the film is very very good, and this is a fantastic opportunity to see the film early and support a really worthy cause. Tickets for the Milk red carpet debut are available for purchase online (via Ticketmaster) and at the Portland Center for the Performing Arts (PCPA) box office (1111 SW Broadway). Prices range from $37.75 – $71.75. The event starts at 8:30 pm.